It’s Year-End Time Again, are You (GP) Payroll Ready? 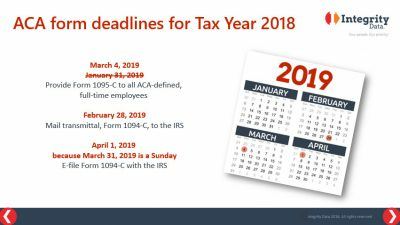 Year-end is a busy time of year for HR and payroll professionals: along with their “normal” everyday duties, they have to deal with added challenges of open enrollment for benefits, getting W-2s distributed on time, and ACA 1095-C reporting. Fortunately, the IRS gave us an extension for providing 1095-Cs to employees so we get some breathing room on that one at least. We’ve put together some pertinent payroll year-end information for you – all in one spot! Mid-November: Microsoft Dynamics® GP 2015, 2016 and 2018 year-end update released - the GP 2018 update includes R2! No update for Dynamics GP 2013: Time to upgrade! We recently did a webinar on Dynamics GP year-end activities. View the recording here. Integrity Data ACA customers can rest assured that their ACA reporting solution is always up-to-date. The ACA solution is now able to generate 1095-Cs for 2018. We’re ready to start on these forms when you are. Let us know if you need help getting through your ACA year-end activities, whether that’s just some additional hand-holding, or having Integrity Data perform your ACA year-end activities for you. Lastly, payroll professionals have to deal with ensuring deduction amounts are correct for the new year; while also making sure the IRS limits are setup correctly in their payroll systems. The FICA Social Security wage limit is going to $132,900. This amount will be included with the year-end tax table updates from most payroll software vendors, including Microsoft Dynamics GP. Be sure you don’t apply this until you have completed your last payroll of 2018 and you have created your year-end W-2 file. Be sure to review shared maximums. The tax rates for imputed income of employer-paid life insurance are unchanged for the upcoming year. Remember, the Tax Cuts and Jobs Act has affected the taxability of many employer-provided fringe benefits. Make sure you are properly applying these new regulations. Staying current on the ever-evolving regulations around payroll and human resources can be challenging. The Integrity Data team works hard to make this easier for you. Reach out to us with your challenges and we’ll work hard to come up with a creative solution using technology and services.